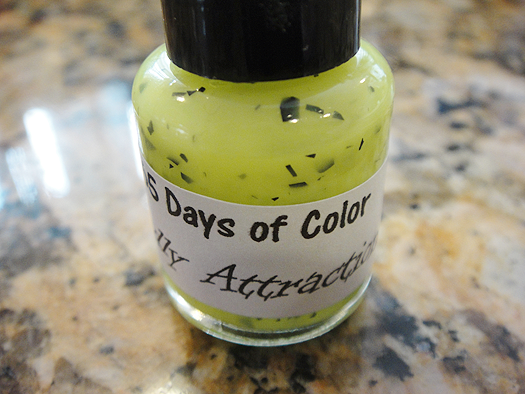 365 Days of Color Toxic Love Collection! Hi lovers! I'm so excited to show you this new summer collection from the ever-so-lovely Sunny from 365 Days of Color for two reasons: 1. I LOVE neons and 2. 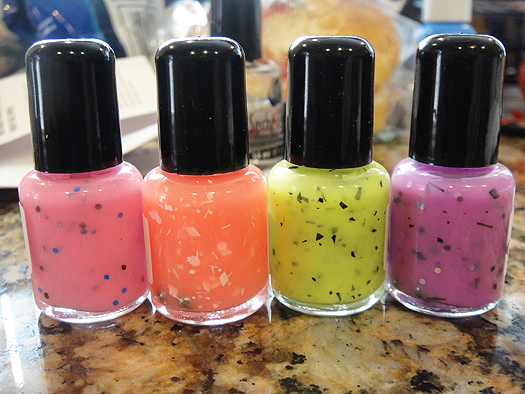 I LOVE Sunny's polishes! I won't even bother blabbin' and just move right along to the pictures. A back view to check out their cute little behinds! 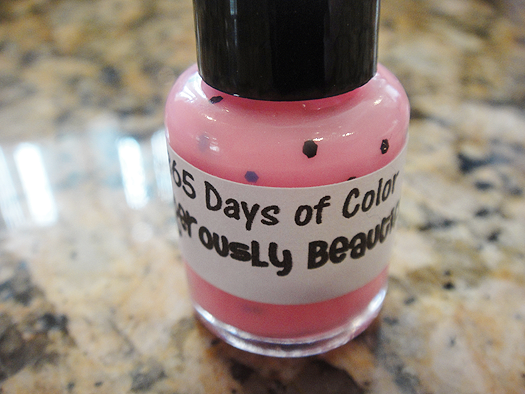 Dangerously Beautiful is a neon pink jelly with black and blue hexes. This is a little bit brighter in person but camera was like LOL NO I WILL NOT SHOW HOW BRIGHT IT REALLY IS but it really is neon. I had a bit of a hard time getting the glitters out but it wasn't a huge deal. I know a lot of people hate having to fish for their glitters but I personally don't mind. If you like something, you sometimes have to work a little :) Three coats over white polish. Chemical Romance is a neon purple jelly with black shreds, diamonds, hexes and bars mixed with gun metal and holographic hexes. LOVED this. What a beautiful shade of neon purple! I had no issues with the glitter and had a smooth application! Three coats over a white polish. 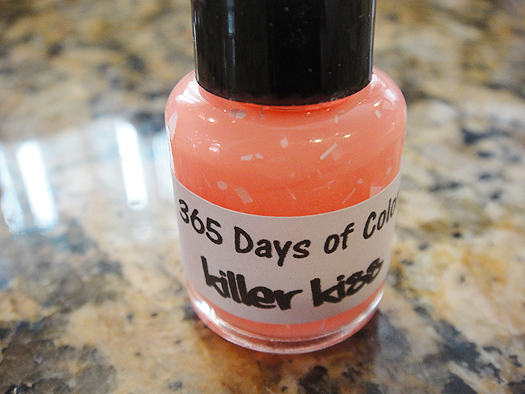 Killer Kiss is a neon coral-y peach with white hexes, shreds, squares, bars and diamonds. Again, my camera didn't cooperate with showing just how bright this is but wow. Just wow. My favorite of this collection! A tiny hard time getting the glitter out but again, I didn't mind! Three coats over a white polish. Close up to show the hexes and other shapes! 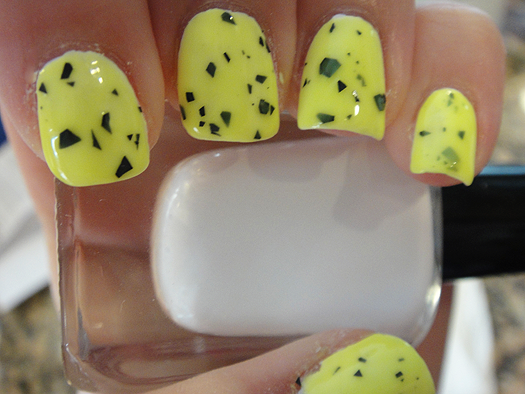 Deadly Attraction is a neon yellow with black shreds. Okay, I lied. THIS might be my favorite of the collection. 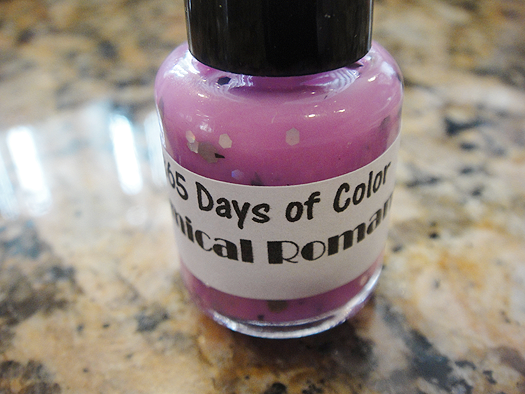 My apologies for the dried on cuticles; this was my last polish to review! Absolutely NO problems with the shreds. They practically fought their way out that's how easy it was to apply them. Super smooth application with three coats over a white polish. * All polishes were layered over Andrea's Choice Reverso. 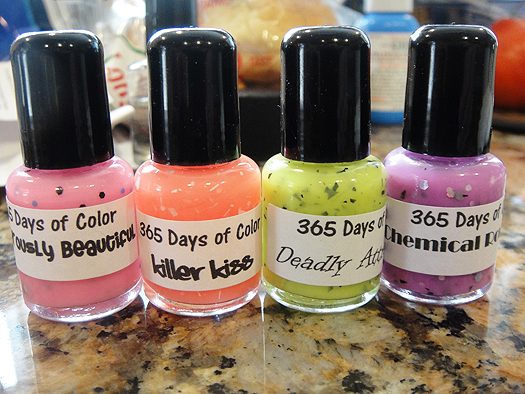 Where To Buy: 365 Days Of Color @ BigCartel - $8 for full size and $4.50 for mini. Make sure you 'LIKE' her FaceBook page and check out her blog! Ah, girl get on that! AW, you're too sweet! Aren't they? Perfect for the summertime! Oh wow! I'm really liking Killer Kiss!